Shoulder Bursitis is a common injury that we see in many people visiting the Adore Yoga Therapy Clinic. It’s painful and, if left untreated, can lead to restricted mobility and ongoing shoulder pain. Yoga Therapy can be a very helpful adjunctive treatment - here’s a primer on working with students with shoulder bursitis. A bursa is a small, fluid filled sac that sits between two body structures, such as between muscles, bones and tendons. Bursae act as cushions to reduce friction between the two surfaces and help to make movements smooth. Bursitis occurs when one of these sacs becomes inflamed, causing significant shoulder pain. 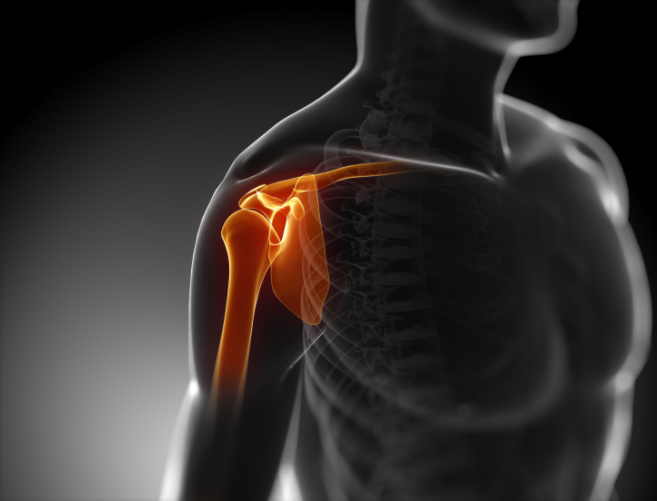 Shoulder bursitis is usually caused by awkward or repetitive over-use of the shoulder joint, or by other injury to the shoulder area. Subacromial bursitis, which is caused by an impingement of the bursa between the rotator cuff tendons and the acromion (the bone at the top of the shoulder joint), is a common cause of shoulder injury. It’s often experienced by yoga students who practice a lot of vinyasa, such as ‘scooping through’ into up-dog and highplank/low plank positions. Bursitis often goes hand in hand with rotator cuff tears and tendonitis, so it’s a good idea to ask your students to get a full diagnosis (usually using Ultrasound or MRI). After diagnosis of shoulder bursitis, your yoga therapist will recommend a combination of rest, cold packs and gentle mobilising exercises can help, along with anti-inflammatory medication. Yoga Therapy can be helpful both for speeding up recovery and preventing future flare-ups. Our Yoga Therapy teacher training students learn that this is because the gentle movements of yoga therapy not only support healing, but re-pattern postural habits to improve functional movement. When the shoulder joint is moving with fluidity and improved alignment and the student is more aware of the way in which they use the shoulder, the shoulder is less likely to become inflamed again. We’ve created Yoga Therapy Bullet Points for working with students with shoulder bursitis. Learn what postural assessments to conduct and how to introduce gentle movements to manage symptoms. Nikola Ellis is the founder of Adore Yoga, yoga therapist, counsellor and teacher trainer. She conducts regular trainings that help people of all ages, shapes and abilities enjoy the benefits of yoga and meditation, including Meditation Facilitator Certificate Trainings; Level 1 200hr Teacher Training and Post Graduate Yoga Teacher Training in Mental Health, Adaptive Asana and the Foundations of Yoga Therapy and a highly regarded professional 650hr Graduate Certificate of Yoga Therapy.